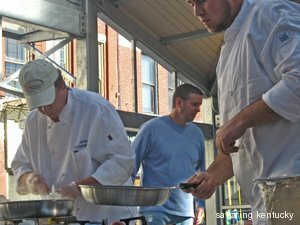 It would take me a long time and a lot of coaching to learn how to photograph a cooking competition. 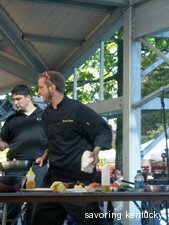 The face-off between chefs from St. Joseph Health System, above left, and Holly Hill Inn, right, took place last Saturday on a stage smack in the middle of the Pavilion that shelters the Lexington Farmers Market. I left before the winner was announced, so I can only say it all looked and smelled delicious. The notion of cooking as a basis for competition has always a- and be-mused me. As I watched these crews hustling and sizzling their baskets of fine Kentucky ingredients, I realized Lexington -- in the middle of a whopper two week competition involving horses and equestrians -- will soon host a couple of other intriguing and unusual competitions. First, the Kentucky Yoga Championships (perhaps with some Hoosiers involved) happen at the Kentucky Theatre on Saturday, November 13, from 9 AM - 12 PM. Until I became a student at our fine Bikram Yoga Lexington I had no idea yogis ever competed on anything other than calming their minds and getting their Tree Stand poses ever more upright. The competition website says yoga competitions began in India hundreds of years ago. Now experienced judges will be in Kentucky to choose a woman and man to advance to international competition in February, 2011. I'm expecting the competitors in this first-time, free event will astonish me. Ideally some of their flexibility, strength and balance will float out into the Kentucky Theatre and settle in my bones to improve my own practice. This event is free and invites sponsors to help with costs. For another type of extreme, extremely thrilling sport, wait one week and go to the Metropolitan Opera District Auditions, on Saturday, November 20, at 10:00 AM at Memorial Hall on the UK Campus. Up to 30 of the biggest voices in the country will compete for the right to advance to regional competition, and then national, being heard at every step by celebrated, distinguished judges who are themselves famous opera singers, vocal coaches, and music administrators. This event, like the yoga competition, is good for our bones, since they literally vibrate as the powerhouse singers make their way through many beloved arias. This event is free, although donations are requested and welcomed. One of the judges, opera star Samuel Ramey, will conduct a free master class at Memorial Hall the next day, Sunday, November 21, at 2 PM. The master classes are some of the most delightful events in the entire wonderful season of operatic opportunities the University of Kentucky Opera Theatre presents annually. By then, we'll know the WEG outcomes. Perhaps I will also have learned whether Holly Hill trumped St. Joe's last Saturday in the Spotlight Lexington competition, or vice versa. The world is coming to visit central Kentucky this year for the Alltech FEI World Equestrian Games. To help our visitors know more about Kentucky's food and food ways, Savoring Kentucky is rolling out 116 Savory Kentucky Bites, one for each of the 100 days before WEG begins, and 16 for the days during WEG, September 25 - October 10. Today's Savory Bite is number 111.